Propel (the world’s leading developer and manufacturer of radio-controlled devices) has recently released a new toy on the market, launching gaming and high-tech droning into the next galaxy. With The Last Jedi having hit the big screen last month, and more themed merchandise arriving on shelves around the country, Star Wars-mania is well and truly in the air. The epic trilogy created by George Lucas in 1977 – with its sci-fi ninja-like warriors, robotic droids, and other unknown, distant galaxies – Star Wars has earnt over USD$42 billion at the box office to date, and John Williams’ theme tune resonates through popular culture. I remember first being introduced to the fictional universe as a young child with the excitement of lightsabers, the Jedi, the force, the different planets and space ships…I was enchanted by its galactic splendour and regularly asked myself: how cool would it be if all this was actually real? Fast forward twelve years, and I still have that little thought tucked into the back of my memory. So in being invited by Propel to Sydney to attend the launch of a Star Wars Laser Battle drone, it was sort of a no brainer for me. I was more than ready to go to relive some serious childhood nostalgia. And I definitely wasn’t disappointed. Arriving at the event held in a warehouse space in Sydney, Australia, it was as though I’d stepped into a dream – the flashing lights, the soft buzz of propellers turning, the zap of the drone’s lasers. Watching the drones hovering off the floor and whizzing backward and forward like hand-sized insects, I honestly couldn’t wait to fly one of these remote-controlled devices for myself. Before my eyes. Think WWE for drones and that’s what I was looking at. It was a treat to see the five media representatives battle it out in this arena, with the crowd yahooing and booing on each move of their devices. Next, I was taken by Bishop to the production room where I was explained how the drones were produced, packaged and distributed in their own, distinctive ways. It seems that the thrill doesn’t just come with the flying of the little drone. When first purchased, the player has the excitement of its individually numbered, specialized matte black box. When you lift the lid, the famous theme tune plays to reveal the specific drone perched on a white-lighted box. An exciting little treat from the Propel team. Based on the original films, these drones have been constructed to be more durable, and way faster than any other gaming drone on the market (reaching speeds of up to 45 km/h). 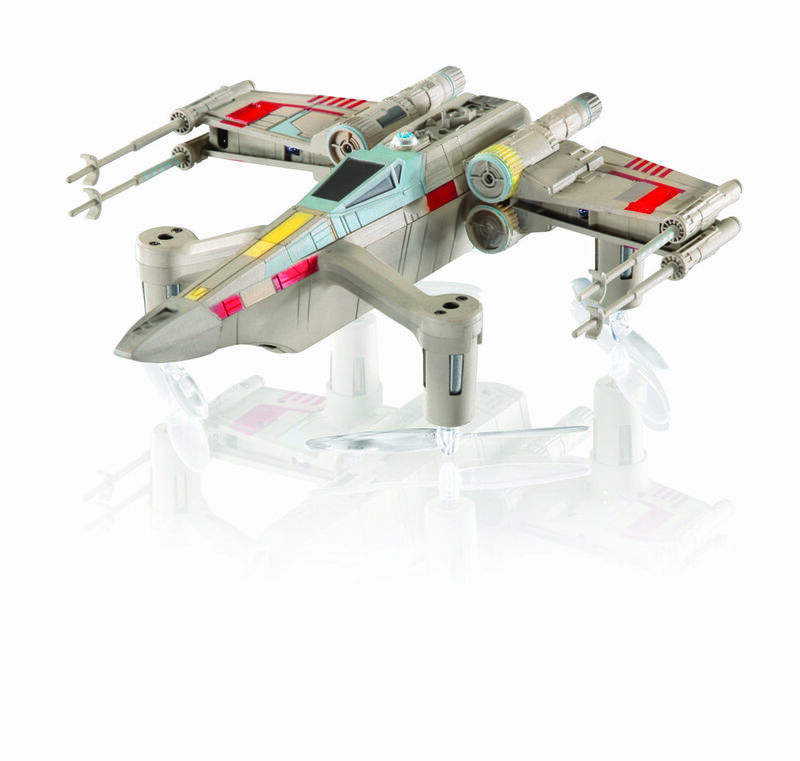 The collection features three hand-painted, highly crafted units: the 74-Speeder Bike – with its Return of the Jedi-based Storm Trooper character and hyper-accurate model multirotor – the T-65 X-Wing with its fast speed – and Darth Vader’s Tie Advanced X1 with its ease of flight. These three drone devices compliment the art of flying by optimizing individual player performance in both the literal and visual world using the latest innovative LiFi. The first product globally to use Lifi, the brand new technology – founded by Propel – is 100 times faster than WiFi, for instantaneous gaming excitement. Up to 12 drones at a time can fly at once with this new software. 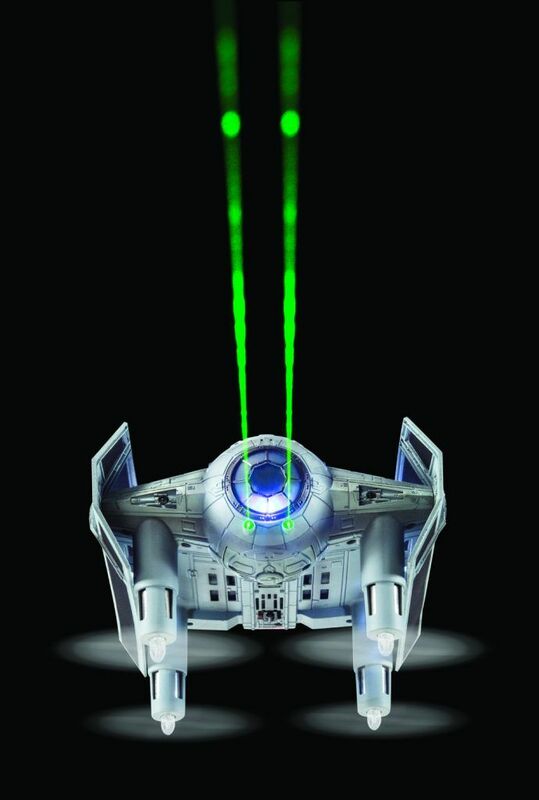 As well as LiFi, the new Intelligent Awareness Technology provides a real-time response to the players technique of flying with their remote control device sending them instructions audibly on how to battle their enemy (in the voices of your favorite Star Wars character). Now seems the right time to say that I had never actually flown a drone at all prior to the launch, so, after I was taken away from the production room, wide-eyed in wonder, I found the 34 simulator training missions on the new mobile app quite helpful. Seemingly easy to get the hang of – after a few near-fatal crashes thanks to the inbuilt T-mode (or training mode) – this is a nice addition for those quite hesitant and not familiar with the mechanics of flying a usual drone. Hand-to-eye coordination is a must for flying any drone and, unfortunately, an ability I somewhat lack. But that’s the thing about operating this small device. No stress came with flying it. Propel has utilized on the usability of the product by making it durable for all conditions and less of a hassle to fly with the Reverse Propulsion propellers, which are placed on the bottom of the drone instead of the top, pushing air downward, creating a new way to keep the drone afloat. It also gives the effect of the drone, when flying, just gliding through the air as though unassisted. These drones look authentic, are easy to fly and are a lot of fun to play about with. It makes me excited to see what Propel has in store for the future. After the launch in Sydney, I returned home with the Star Wars theme song still playing in my mind and the zap of the drones still ringing in my ears. It was an experience that allowed the young child in my memory to come back to life, and indulge itself for an afternoon. I felt like a kid in a candy shop. Propel has really ticked all the right boxes for any other drone fliers (or Star Wars fanatics) pleasure. The Star Wars drones are now available from PB Technologies, JB Hifi, Harvey Norman, Noel Leeming and selected Heathcote stores.